W O H Mitchell’s Who Has Seen the Wind, had been listed in the published syllabus for the course and many of us had newly purchased copies of it sitting on our desks. John suggested that we could read it if we wanted to kowtow to the system or we could read something more challenging of our own choosing. This annoyed me, because I’d purchased “Who Has Seen the Wind” and read it during the summer break, anticipating that this would help me towards my goal of an A in English. John suggested that rather than reading books that the school-board gave their stamp of approval to, we might like to read some books that over the years had been banned by more than one or two school boards. He then opened up his cupboard and revealed all sorts of books free for the taking as long as we promised to pass them on to someone else when we finished reading them. That year I read, “For Whom the Bell Tolls,” and learned to love Hemingway, “Catch-22” and contemplated the horrors of war, Steinbeck’s “The Grapes of Wrath,” Fitzgerald’s “The Great Gatsby,” Tennessee William’s “A Streetcar Named Desire,” Ginsberg’s “Howl.” My own love of books had met its match in John. In classroom conversations, John pushed us to see beyond the words on the page in order to discover what the words could teach us about ourselves. At the end of the year, John invited us all to read Ray Bradbury’s “Fahrenheit 451.” In retrospect, I realize that he must have purchased enough copies for the whole class from his own pocket. John promised to take anyone who read it to a theater in the city to see the movie. A few years before this, I had tried to read my younger brother’s copy of Bradbury’s “Martian Chronicles,” but failed because I simply couldn’t appreciate science fiction. So, at first, I declined John’s offer. But this wily purveyor of wisdom persevered. He insisted that I would see myself in the heroine Clarisse who never stopped asking questions. John said that this, to “know thyself” is the life quest of every human. The quest to know our very selves is the point of this wild journey that we are all on. Our quest to find the answers to the questions: Who am I? Who are we? What are we? What are we made of? Who made us? What are we here for? Where do we come from? Where are we going? Who are we? Know thyself. Our life purpose, according to John is to seek the answers to these eternal questions. When the school year ended, so did John’s tenure at our high school. Turns out that School Boards really do want teachers to follow the curriculum. But to this day, I still treasure the pearls of wisdom that this prophet of life taught me; this wild man draped in leather, who cried out to a bunch of teenagers, warning us of the dangers of accepting the system’s status quo, this prophet who tried to make a path for us to find our way. Then take this fact unto thy soul,— God dwells in thee. It is unknown to thousands, and to thee; Yet there is God. I’ve loved that poem since that old prophet first recited it to us. I loved it even before I understood it. 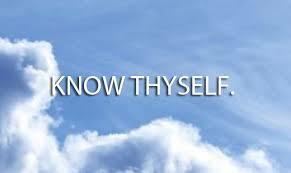 Know thyself for in knowing thyself, you will know the Infinite embosomed in your very self. The selfsame One that rules the Whole, speaks in you. A few years ago, I met another prophet. A voice crying in the wilderness of the church. Many of you met him as well. Bishop John Shelby Spong, has been here with us tree times and each of his visits has revealed to us the kind of wisdom that only a wild prophet can impart; a prophet like our dear John has the power to make a path through the wilderness of Christianity. For years I’d met my self in the pages of Bishop Spong’s books and then one day there he was; in Tom’s kitchen, shaking my hand and insisting that we call him “Jack”. Jack continues to try to clear a path through the wilderness of Christianity and culture in order to help us know our very selves. Over the years we have learned so much from this wise man, this modern John the Episcopalian, with his purple bishop’s robes whose passion for scholarship cuts through the pain of religious nonsense with a knowing grin and wise vision in order to clear a path toward his vision of intellectual vigor and common sense. Jack, this wild prophet, has helped level the playing field between clergy and laity by lift up scholarship in ways that enable access to millions. He has trained entire congregations to use new lenses to interpret scriptures in ways that have recognize the mythological character of our sacred scriptures. During this season of Advent, I always reread two books the first is Jack’s “Born of a Woman, and the second is Dom Crossan and Marcus Borg’s “The First Christmas.” I read these books to remind myself that there is a way through the wilderness of sentimentality that permeates this season; a way that takes seriously the mythological character of our treasured stories. Advent is more than just a time of waiting for Christmas to arrive. Advent is a subversive time of returning to the darkness of the womb in order to discover what lies at the very core of who we are as a people. In the darkness we meet a kind of silence in which we can actually hear our selves and if we have the courage to dwell in this sacred dark and silent place we might just be able to prepare ourselves for the light, which will come when we move beyond the words. This primordial need to dwell in the darkness and silence of our very selves is something our ancestors understood; something our modern world manages to make us forget, with its notions of literal truth, historical truth, scientific truth, actual truth or absolute truth. Our stories prepare a pathway for us a pathway marked by mythological truths. Let me quote the great man himself on the subject of the myths we find in the scriptures: “Mythological truth is of a different order from either literalism or history. The purpose of the biblical stories of Jesus’ birth is to introduce us to this order. Hidden beneath these myths are expressions of the human hope that even in the darkness of winter we are not alone in this universe. There is within all human life a yearning to know that the realm of the spirit does enter and indeed does permeate the earthly realm that we inhabit. In our imagination we always tended to locate that spiritual realm above the sky. So our myths speak of mysterious signs in the skies of heaven all of which serve to announce that the Christ Child is the one life in whom God is experienced as fully present in the human realm. These symbols remind us that this planet earth is not just a tiny clod related to minor star located about two-thirds of the way toward the edge of our galaxy, but rather makes the claim that on this earth we bask in the direct gaze of the God, who is the source of the life that fills the universe. We further claim that it is within this life itself that we find meaning and purpose and that is how we know that we are not alone. That is the Christmas claim and its appeal is a very powerful one. That is also why we cling to our interpretive myths so tenaciously. No myth is literally true. It is the nature of myth to point to a truth that limited words cannot embrace. That is what the biblical stories of Jesus’ birth do and that is why we love them passionately and respect them so deeply. Our assertion in these stories is that there is a place in this world where God and human life come together. Every year, over and over again, I am asked to explain how we are meant to deal with the stories, metaphors, parables, symbols, and axioms that we find in the pages of the sacred scriptures. During the season of Advent, when we are all anticipating the retelling of the all too familiar birth narratives, the dilemma of how to approach these beloved stories is enough to drive a progressive preacher to distraction. I could and indeed, on many occasions, I have unpacked these stories in an effort to reveal their historical context and possible meanings to their ancient writers and listeners. I could and indeed, on many occasions, I have unpacked these stories in an effort to reveal the many ways these stories have been misunderstood and abused down through the centuries. I could and indeed, on many occasions, I have unpacked these stories to reveal the multi-layered meanings of the symbols and metaphors as they point to the mystery that lies beyond the story. But as I reflect on the words of the prophets I have known, from John the Baptist, through John Ripple, and even to John Shelby Spong, I suspect that the lasting quality of the birth narratives lies not in what they reveal to us about Jesus of Nazareth, but rather in what they reveal to us about ourselves. For until we can see ourselves in the fear of young Mary, in the stalwartness of Joseph, the bumbling awe of the shepherds, or the wisdom of the gift-givers from the east, we will never know our own sense of homelessness, we will never understand our won deep longing, a longing that drives our own quest to know ourselves. Until we can recognize the needy Christ-child in all the children of the world, we will never be able to comprehend the mythological truths revealed in our own sacred stories and we will miss out on the mythological truths revealed in the sacred stories of others. Know thyself. For in knowing thyself, you will know the Infinite embosomed in your very self.The selfsame One that rules the Whole, speaks in you.Know thyself. For within your self beats the heart of Christ. Know thyself, for the heartbeat of Christ will prepare the way for you to know the heart that beats in your neighbour. Know thyself, so that your neighbour can see God in you, just as you see God in your neighbour, and together we can prepare the way for the advent of our God into a world in need of the LOVE that is God. Know thyself. For in knowing thyself, you will know the Infinite embosomed in your very self.The selfsame One that rules the Whole, speaks in you.